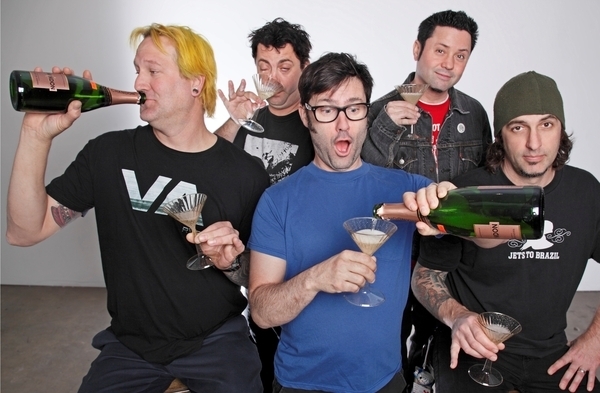 California punk band Lagwagon needs no introduction. The first band ever signed to Fat Wreck Chords are still going strong and remain one of the most influential bands in the scene today. Scene Point Blank had the chance to talk to frontman Joey Cape about the band’s recent reissues of their first five albums, getting back together and touring, and what it’s like to be in a band with so much history. Scene Point Blank: The Lagwagon reissues have finally been released. Are you pleased with the end result? Joey Cape: Definitely, yeah. I mean, along the way there were times that I was slightly apprehensive and maybe even a little scared that it was going be too self indulgent or something. It’s kind of weird when you’re putting something like that together, it’s self indulgent to begin with to a certain extent. I really like the way it came out and I like how it shows the band’s evolution. We all worked really hard on it and I think it paid off. Scene Point Blank: You got to look back on so many personal things regarding the reissues like old photos, songs, and memories in general. Was it good to reflect on these things or was it more of a bittersweet feeling? Joey Cape: It was mostly positive and just a tiny bit of bitter, but mostly sweet. It was maybe even cathartic for me. When you’ve been in a band as long as I have and you don’t have much of a memory—I have kind of a crappy memory to begin with—it’s really lame sometimes when you can’t encompass your band’s history and look at it as a whole. You certainly can’t remember when certain things happen. You remember things out of order and, obviously, there are select things you remember. It’s just like life in general. It was so cool to put that all together and debate that timeline with other people and get it straight. It’s really cool. I feel like I know my band that I’ve been in so much better now. And I get to know what people with normal memories feel like. 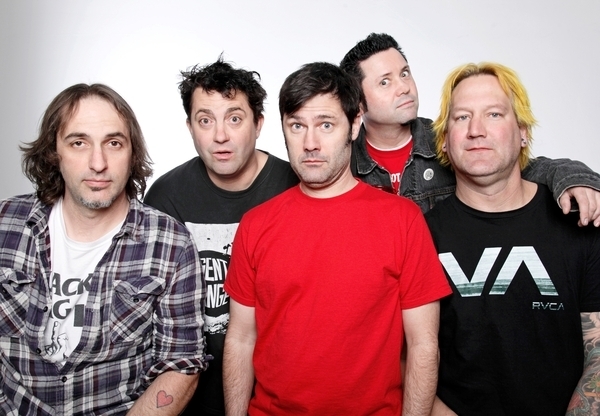 Scene Point Blank: Lagwagon has played a few shows already this past month and there are more coming up. How have those been so far? Joey Cape: The first one was like when you get back together with somebody and the first night is awesome. [Laughs.] The first night was so great. We had all the various old members that are living come back and play. It was just a big party. We played like two-and-a-half hours in San Francisco, where I live, and it was just great fun. Now we’re on tour with NOFX and we’re playing like forty minutes, and obviously those guys are friends and it’s a cool thing, but we’re kind of back to reality where we don’t have everybody with us. It’s not quite as fun, but we’ll be starting our own tour in February. We have a bunch of other country tours coming up and stuff, that’s sort of what we do. We’re planning to do a bunch of U.S. touring too. It’s cool to be doing it still, I’m definitely kind of refuelled by that boxset. We’re only playing songs off of those five records when we play shows now. Scene Point Blank: The band never signed to a major label and you guys have stuck with Fat Wreck Chords throughout. Do you think things would have been completely different if the band did sign to a major label? Joey Cape: Yeah, major labels were all over us! But yeah, we really didn’t get approached much. It’s kind of funny, I think there was a short period of time when Green Day and Offspring were doing so well and I think maybe there were some labels looking for bands. I heard a lot of stories of other bands being approached. Not long before that we had somebody from Priority Records come to an LA show and it was kind of a big deal, but we didn’t take it too seriously. I don’t know that we were ever drawn to it, there was no allure for us there. Scene Point Blank: There’s something about the music industry becoming less corporate and more like a family with your relationship to Fat. Did the music Lagwagon produced reflect that relationship? Joey Cape: Definitely. The thing is: the relationship that we’ve had with Fat has been forever now. It’s really natural now. I mean, when we want feedback, we can get it. And we have, at times, asked for it, but there’s nothing in your face ever. There’s no distinct schedule and you can’t beat that. A lot of bands have to deal with outside pressure, and it’s hard enough just internally to keep it together when you’re in a band and hanging out with a bunch of dudes on the road with dirty socks. It’s not pretty. [Laughs.] I think part of the reason that we’ve endured it for so long is just not having that external pressure from a label, or management, or any kind of production people. That’s been really cool. The other thing about being on Fat for so long that I always cite as positive is that we’ve kind of rode the wave with them. We went up the hill with them and went through experiencing things getting much better for them and the band simultaneously. Things have definitely changed and simmered down, and things are so different now with the record industry in general and Fat is obviously no exception—or the band, we’ve done that with them as well. It’s like family, lifers, we’re committed! There’s a lot of strength to that and not everybody has that opportunity. I don’t like to act arrogant about it or anything, but we just knew that it was a fortunate situation and we never saw anything broken so we didn’t fix it. Scene Point Blank: It’s been said Lagwagon was bigger in other countries in the beginning, and I’ve heard people talk about just getting into the band recently, and with the reissues you might gain new fans. Is it weird or flattering that people are getting into the band even though you guys don’t play as much? Joey Cape: Hey, I’ll take anything. I think if you make any kind of art and people enjoy it, it doesn’t matter where it comes from or who it is. I’ve never really worried about that kind of thing, it doesn’t matter to me at all. That’s great, I hope that’s true! I guess that’s probably one thing positive about doing the reissues is that maybe people that heard of that band but never really got into it can check it out now. You know, it’s funny, there’s a fine line between when you re-release really old music between it being really dated and sounding fresh somehow. [Laughs.] I was doing some remixes for that record and we remastered everything, and there was a few times where I had these funny little epiphanies like, “Huh, what if this came out right now? What if this was new?” I’d be like, “Well the band would be kind of sloppy, and it’s not the tightest thing, and the production is questionable,” but there’s something cool about that because you can’t go back in time. You can’t fake it, not that we tried or anything, we always just kind of evolved. There’s something nice about that. We’re trying to play a lot of those old songs live now and it’s tough. Scene Point Blank: Most of your lyrics are super personal and sometimes super dark. Is it ever hard to be vulnerable when you’re making music and performing it? Joey Cape: There’s been times were I felt like maybe I was over-exposed just a little. Maybe over-sharing I should say, in a sense that maybe you don’t always want everybody that listens to it or takes the time to read the lyrics to know those things. I found out at a pretty early phase in my life as a songwriter that the only way for me to do it was from the heart and to do it truthfully. To find that element that exists in music that I think people want, which is conviction and purity, I can’t get that unless I go deep in the past and I guess bad stuff was happening in my world. So that was it for me, that’s just the only way I know how to do it. Scene Point Blank: Given that you write these personal things, a lot of people relate to them and admire you for it. Does the admiration other people have for you ever weird you out? How do you handle it? Joey Cape: Definitely, I mean there’s times that people I’ve never met in my life will grab me and say, “Man, that song that you wrote saved my life.” Or maybe they’ll be drunk, which is sometimes even worse, and they’ll start to really share with me as fast as they can because they only have this little moment when I’m hanging out at a show or something. There’s times when I’m not in the mood to talk about some family tragedy that someone else had or about something that I wrote about that I don’t want to revisit over and over again, but I wrote about it so I’m asking for it. I take all of that stuff with a grain of salt, you have to just remind yourself that it’s flattering that there’s any interest at all. I try to remind myself that it’s a good thing. It’s really rare, but every once in a while I’m just not at all in the mood for that moment with somebody. Other times it turns out to be really nice to connect with somebody on that deep level about something that happened to them or about something that’s happened to you. It just depends. Scene Point Blank: Music is such a huge part of your life. Could you see yourself not involved with music in some way? Joey Cape: That’s something I think about all the time. For just monetary reasons, I look at my life and I have a family that I have to support and have to look at those things for those reasons. For me, I know I can’t see myself doing anything else. When I’m faced with the fear of everyday stuff, like what am I gonna do, I gotta figure out a way to keep feeding my daughter. I start thinking of other possibilities and none of them seem at all viable or possible. I do remember though and realize you can be a musician and any kind of artist and it doesn’t have to make money, you just can’t do it full time and I would imagine most great artists didn’t make a living off of it. There is a weird irony in the whole thing, just the idea that I could actually create music and be a musician and not do it as my full time job. I just haven’t found anything else that I can do, honestly. And that I would want to do. And I still love it. Scene Point Blank: I know this might be a hard question, especially given that even more tracks were just added with the reissues, but what’s one of your favorite Lagwagon songs? Joey Cape: Oh god, I can never do that. I’m terrible at answering that question. It’s all about the melody for me and when it kind of worked, but I really just don’t have a preference. There’s times that I really like a song like “Eat Your Words” that was one of the bonus tracks that made it on the boxset, and I think it’s from the Let’s Talk About Feelings era, and I really like that song because Lagwagon was kind of stretching our arms out and trying something different. “Owen Meaney” is another song like that. Those are sometimes some of my favorite Lagwagon songs because they’re just different. On the other hand I like revisiting that Trashed record I had kind of forgotten. I think we were kind of at our peak with the early band when we made that record. It’s really intense and kind of relentless, which is cool too. It’s hard for me to pick songs and I guess I get too close to them and by the time they’re done I sort of never want to hear them again. [Laughs.] There’s always a little bit of that too you know. Scene Point Blank: You have Lagwagon, side projects and solo projects, and always seem to be ready to produce something new. Do you have any plans in the works for this new year? Joey Cape: Well I’ve been recording when I’m home. I’m always working on something. I’m one of those people that believe that downtime is not a good thing. I don’t really see any reason. Most people go to a job and they work forty-to-seventy hours a week and they don’t have downtime. So if I tour for a month and I come home and I don’t have anything to do for a few weeks, that’s cool, but that’s a lot of wasted time. I have a studio at my house, so I’m just always writing, recording, and trying things. Sometimes there’s large gaps and there’s nothing going on with Lagwagon or the Gimme Gimmes so I just start a new band. [Laughs.] Which is ridiculous, I know, but it’s just what I know and I appreciate that I’m able to do it. I’m working on a few things right now. I’ve been recording a lot of acoustic stuff and I’m doing this split. It remains to be seen what will happen. Words by Kristen Swanson on Feb. 18, 2012, 8:01 a.m.
Posted by Kristen Swanson on Feb. 18, 2012, 8:01 a.m.
Posted April 6, 2019, 12:30 p.m.
Posted March 24, 2019, 4:52 p.m.
Posted March 2, 2019, 7:46 p.m.